If fashion provides escapism, how do you define couture? To me, couture is the pinnacle of dreaming. The clothes presented on the runways biannually, in January and July, are of the highest excellence in craftsmanship and design, which collectively amounts to hundreds of thousands of hours of laborious work. With everything that is going on in the world couture week couldn’t have come at a more optimal time. It commenced in the last week of January. As the designers were presenting their collections to the über-rich and the press, the surreal world we find ourselves living nowadays continued to shock, startle and scare. Spring 2017 couture week began with Maria Grazia Chiuri’s sophomore show for Christian Dior at the Musée Rodin on Monday 23 January. 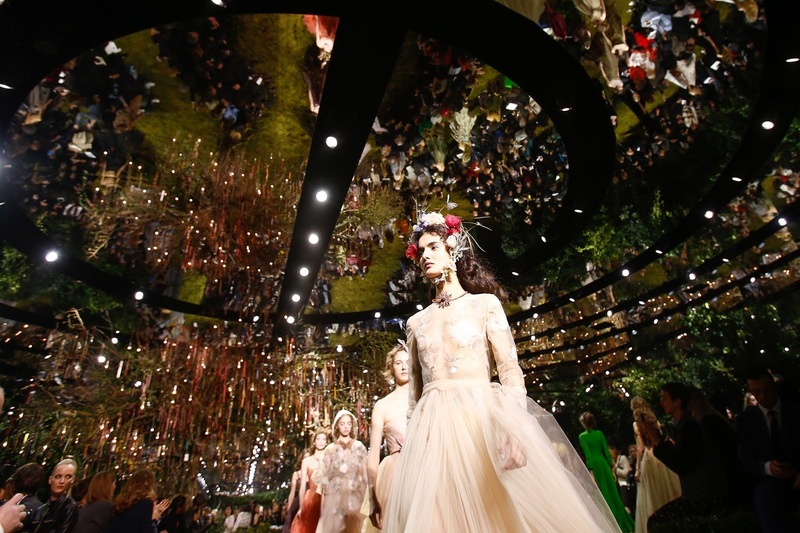 Boxwood hedging, shrubbery and bushes converged to fashion a maze; there were twists and turns and a mirrored ceiling. Atmospheric to say the least. A wishing tree was the centrepiece. Chiuri’s first order of business? The nu-Bar jacket. The “jacket is deconstructed and reinvented, even as a cape.” Bill Gaytten, Raf Simons, Lucie Meier and Serge Ruffieux have all interpreted the Bar jacket, perhaps Christian Dior’s most iconic piece, in their own way. Chiuri successfully subverts the femininity of the piece with masculine proportions. The opening half of the collection prioritised masculine shapes, and it was frankly the better half. (There were some gowns at the beginning, such as a cream number worn by Natalie Portman at the Screen Actors’ Guild Awards on Sunday evening.) Sadly, as with her debut, Chiuri couldn’t shed the Valentino aesthetic. The Italian brand’s sensibilities—her sensibilities—pervaded the evening wear here and it was distinctly boring. It’s all been seen before. Even if it is in a far more effective venue. “In the dark we will see clearly, my brothers. In the labyrinth we will find the right way,” a quote by Henri Michaux headlined the press release. It was indicative of the weary world around us, what with immigration bans, the war on truth, but also Chiuri’s vision: the first part of this collection delightfully Dior but the latter half morphed into a vacuous Valentino denouement. I trust she’ll find her way out of the labyrinth. While Maria Grazia Chiuri explored the complexity of the labyrinths with deconstruction, Karl Lagerfeld at Chanel was after the opposite. The German designer wanted serenity. Firstly, there was an uncomplicated set erected in the Grand Palais. (Chez-Dior there was a mirrored ceiling; at Chanel, a mirrored floor to reflect the light and polish of the venue.) Chanel haute couture is always the truest to the codes of the house, and also the most reflective. Although Karl is granted leeway with his ambitious ready-to-wear and pre-fall, couture is much more attentive to its longstanding customers’ desires. It’s more formal, more functional, and unsurprisingly the image of Chanel clothing that the masses, outside the industry, would have knowledge of. Boucle suits in mint green, soft lemon, subtle fuchsia, lilac segued into an array of polished evening wear in lustrous silks. In a slinky, model Cris Herman—the portrait of elegance. I hope an Oscar contender snaps this look up and delights us at the awards ceremony at the end of the month in this one. No doubt, her stylist, whoever she maybe, was in the audience with a beaming smile on her face. This fantasy element of dressing up is intrinsic to couture. Women at this show were royalty, wives of royalty, wives of oligarchs and politicians, successful businesswomen and more. They come to Chanel in search of a boucle suit, or a sickly sweet, saccharine concoction to wear to their next cocktail party or gala reception. The styling at Chanel is often obstructive and detracts from the beauty of collections. The impeccability Karl was striving for was achieved with aplomb. 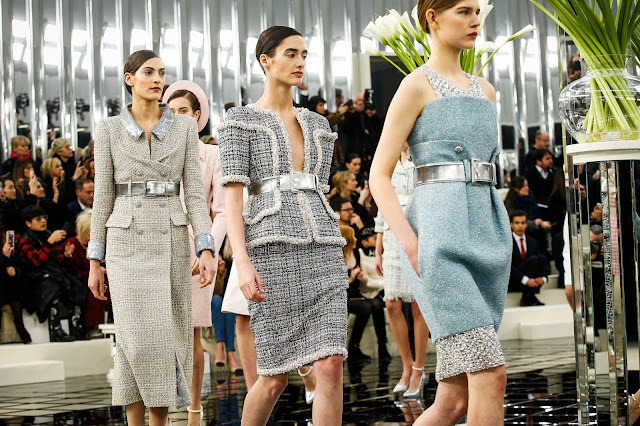 He found simplicity in the decidedly feminine—a remarkable Chanel collection sure to satisfy the house’s staunch supporters. Femininity and old world glamour punctuate couture week. It was ironic then that Vetements, global success, and purveyor of ready-to-wear disrupted the couture schedule with vulgarity, extreme normality. It must’ve been disconcerting for the fashion press to go from a Vetements show to the feather-light, glamourous arena of Armani Privé. It did exactly what it was supposed to do: expand on the house’s language and emphasise tailoring; this season Mr Armani used an eye-catching orange and fabrics such as crocodile to tantalise his customer. There were some nice looks, some not so nice. Either way, something here will cater to the aforementioned high-flying clientele, or perhaps to Academy Award nominees Nicole Kidman and Isabella Huppert, who were perched front row, possibly eyeing up a dress for Oscar night. Armani is functional as Maison Margiela is fantastical. John Galliano has found the perfect fit at the house, transforming its ready-to-wear and couture from 90s-era deconstructed, reappropriated, parameter defying to a subtle, quietly subverted house built on new classics from one of the most creative and talented designers of our time. The artisanal collections have always been among my favourites of his for their innovation and emphasis on craft. The finest piece here was a white overcoat wrapped with black tulle, a photorealistic print of a woman etched into the dark cloud. According to Galliano, he is abandoning the concept of narratives in favour of letting his creative genius run free. However, one caught whiffs of American art past and present within this collection. To intellectualise it further, all eyes are on America and it appears that only the arts is left to combat the Trump administration. Galliano’s images of ‘forgotten America’ during the 1960s echoes the foundations the Trump victory was built on. A Frenchman looking to America; the world looking to America. Effectively, Galliano merged craft and concept to tell his story, as he does time and time again. Craft and narrative was intrinsic to Viktor & Rolf’s presentation. The Dutch couturiers found old garments deconstructed them and fashioned entirely new garments. Colours fizzed, dresses flowed. It was beautiful and a beautiful mockery of the fashion industry—led by Vetements—and the obsession with cutting up and reconstructing clothes anew. 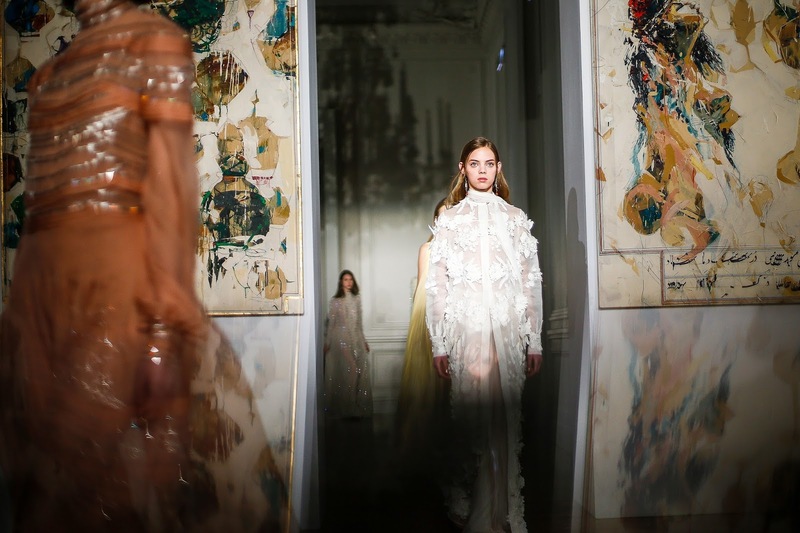 Pier Paolo Piccioli’s first Valentino haute couture collection without former design partner Maria Grazia Chiuri was a sober, quiet but characteristically exquisite. His influence for Spring was Greek mythology. The opening look was a sleeveless, turtleneck gown in off-white with delicate pleating—a Grecian goddess. There were feathery layers of tulle, dusty embellishment, a soft silhouette. Piccioli quashed any skeptics’ remarks about previous solo collections with this, his fourth for the brand without Chiuri. It was confidently quiet and determined in its execution. It wasn’t so much a proposition of earth-shatteringly new ideas or unexplored silhouettes, it was an advancement of the tried and tested Valentino formula. While the other shows without Chiuri lent themselves to an edgier direction, this was very much Valentino doing Valentino—poised, pretty, perfect: the epitome of couture. It may not contribute to anything, what with the endless sea of fashion imagery, but the gorgeous dresses made for an escape from the reality of the world around us. It’s nice to escape, but you always have to remember to keep yourself in check—we can’t afford the luxury of passivity anymore.